Enter this site dedicated to Slaanesh, the chaos god of pleasure, and you immediately are met by a nauseating pink or a thing of beauty depending on your affiliations with the emperor and chaos. The deep pink hue immediately imbues with the sense of the pleasure god. A detailed left sided menu bar allows rapid navigation while the site loads extremely fast. The content section contains a veritable library of useful subsections including articles on tactics, story writing, fiction modelling and collecting armies. A large gallery forms the other main part of the web site. 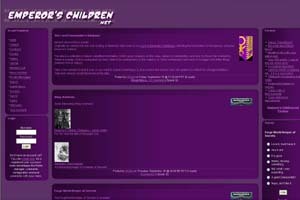 Unusual features includes journals from members of the site, another forum dedicated to Slaanesh follwoed by links for feedback and contacts. The usual web rings and links are present. 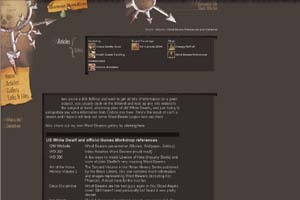 This site captures the feel of the space marine chapter it represents very nicely and the large amount of content supports the theme and the game without rhesitation. The gallery contains wordbearer, nurgle and other miscellaneous models. A comprehensive links section complets this site. The interface and navigation is extremely professional and seamless. It provides an exceptional experince and leaves you wanting for much more of the same. 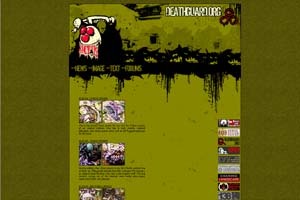 The entry page for the Deathguard site immediately captures the moribund decay of father nurgle. This is a small but straight forward site to navigate. The menu contains few options which load very quickly. The news page contains information regarding relevant event including a white dwarf tactica article by the webmaster and the most recent updates to his army. The text sections contain a few tactica and literary features. The main showcase of the site is the images section where the visitor is treated to an amazing array of superbly converted nurgle space marine army. The fealing of pure decay noted on the entry page is multiplied many fold. It is for this feature alone that the site has been chosen as an example of the lord of decay's followers. The final link leads to a forum dedicated to the followers of Nurgle where much discussions abound. An excellent example of a small but extremely focussed web site capturing the gothic 40K imagery exactly as intended.